U2’s song ‘One’ inhabits the paradoxes of being in a committed relationship where partners are united but different and need, in some fashion, to carry one another as part of sustaining an ongoing relationship which is clearly open to question. The image of partners carrying each other is one that several modern visual artists have also used in exploring the nature of relationships and, just as in the U2 song, images which initially seem positive turn out to be rather more ambiguous than on first sight. They include images of parents and children as well as husbands and wives. In Christian iconography Christ is the primary character depicted as being carried. This is first of all the case in Madonna and Child images and secondly in the Pietá, in which it is his mother who holds him. In these images God is held by a human being. Both images haunt contemporary work in which images of one being carried by another occur. 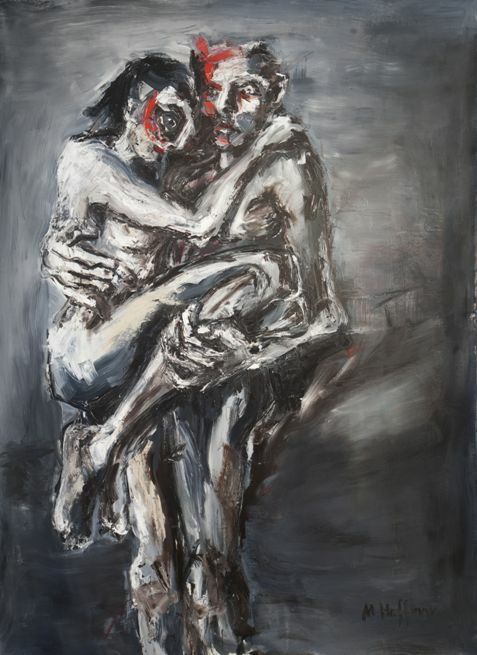 ‘W.E.’ by Maciej Hoffman shows us a man carrying a woman. The couple are depicted in an undefined grey zone, their faces anxious and daubed in red. By separating the letters of the title with full stops Hoffman introduces a sense of separation into the unity of the word which, again, returns us to the paradoxes of ‘One’. 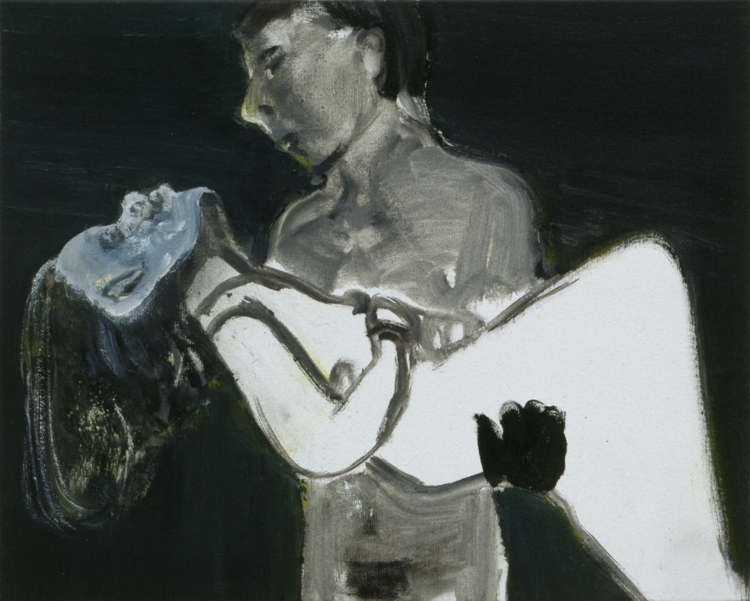 Marlene Dumas is more aware than most of layers of paradox in the images she sources and paints. ‘The Image as Burden’ has for its source a still from the film Camille in which Robert Taylor carries a swooning Greta Garbo in his arms. But this image of a male figure holding a recumbent female also recalls a reversed pietá and references the historical reality that men have produced the majority of images of women. Dumas is aware that all images are loaded with references, which is as difficult for the artist and viewer to hold in mind as it is for the man in the image to hold the woman he carries. The man in the image is holding the woman with compassionate concern, a characteristic which could also be applied to Dumas as she seeks to hold her subjects and their multitudinous references before her viewers. By contrast with the patriarchal historical pattern, most of the images we have considered have been created by women rather than men. Nevertheless, all feature men as the holders and women as the held, in contrast to the Christian iconography of Christ carried by the Madonna. In all these images the participants are either naked or semi-naked, emphasising both the intimacy and vulnerability involved in committed relationships. These are images of compassion and tenderness often experienced in a context of danger, tension or anxiety. We are ‘lovers in a dangerous time’, to borrow the title of a Bruce Cockburn song. For adults in particular to carry one another is somewhat unusual and, these images suggest, generally occurs in times of trouble or difficulty. This leads us to a final and possibly unacknowledged image, that of being carried by God, perhaps as found in that well-known poem entitled ‘Footprints’ where a single set of footprints indicates that in time of difficulty the dreamer was carried by God. Ana Maria Pacheco, Shadows of the Wanderer, 2008, polychromed wood, 260 x 390 x 605 cm. Location: North Transept, Norwich Cathedral. Credit Line: Photo: Colin M Harvey reproduced courtesy of Pratt Contemporary www.prattcontemporaryart.co.uk. Maciej Hoffman, W.E., 2015, oil on canvas, 147 x 210 cm, © Maciej Hoffman. Marlene Dumas, The Image as Burden, 1993, oil on canvas, 40 x 50 cm. Private collection, © Marlene Dumas. Ana Maria Pacheco was born in Goiania, Brazil in 1943. After degrees in both art and music she taught for several years before going to England in 1973 on a British Council Scholarship to the Slade School of Fine Art, London. She quickly established herself as an extremely talented and diverse artist, with work ranging from painting and sculpture to printmaking. Today she is regarded as a leading contemporary figurative artist in Britain. She is represented by Pratt Contemporary, The Gallery, Ightham,Sevenoaks, TN15 9HH, UK. Maciej Hoffman was born in Wroclaw, Poland. In his third year at the Theological Academy in Wroclaw, his craving for philosophy was no longer as powerful as the vocation to become an artist. In 1988 Hoffman enrolled in the Academy of Fine Arts, having graduated with a dual diploma in sculpture and painting. Hoffman went on to pursue a career in advertising and marketing. In 2003 he began exploring web art and became passionate for it. Today Hoffman has returned to exhibiting his artwork. His existential and expressionist work is concerned with the trauma of all individuals and peoples who have suffered - and continue to suffer - worldwide. Maciej is a Polish Jew. He has frequently organised and contributed to inter-faith exhibitions/events. For more, see www.maciej-hoffman.com. Marlene Dumas (born 1953) was born in Cape Town, South Africa. From 1972 to 1975 she attended Cape Town University, where she studied for a BA in Visual Arts. She then completed her studies in Haarlem in the Netherlands. She has lived and worked in Amsterdam since 1976. From 1978 she has exhibited internationally and is one of Holland's most widely admired artists. In the past Dumas produced paintings, collages, drawings, prints and installations. She now works mainly with oil on canvas and ink on paper. The sources she uses for her imagery are diverse and include newspaper and magazine cuttings, personal memorabilia, Flemish paintings, and Polaroid photographs. The majority of her works may be categorised as 'portraits', but they are not portraits in the traditional sense. Rather than representing an actual person, they represent an emotion or a state of mind. Themes central to Dumas' work include race and sexuality, guilt and innocence, violence and tenderness. For more, see www.marlenedumas.nl. Jonathan Evens is Priest-in-Charge at St Stephen Walbrook and Associate Vicar for Partnership Development at St Martin-in-the-Fields, London, England. A keen blogger, he posts regularly on issues of faith and culture at http://joninbetween.blogspot.co.uk. His journalism and art criticism ranges from A.W.N. Pugin to U2 and has appeared in a range of publications. He runs a visual arts organisation called commission4mission (c4m), which encourages churches to commission contemporary art and, together with the artist Henry Shelton, has published two collections of meditations and images on Christ's Passion. Together with the musician Peter Banks, he has recently published a book on faith and music entitled The Secret Chord.